yeast Notes: Yeast is a one-celled fungus that converts sugar and starch into carbon dioxide bubbles and alcohol. This has made it a useful ally in the production of bread, beer, and wine. There are many varieties of yeast. Bread is made with baker's yeast, which creates lots of bubbles that become trapped in the dough, making the bread rise so it's light and airy when baked. A small amount of alcohol is also produced, but this burns off as the bread bakes. 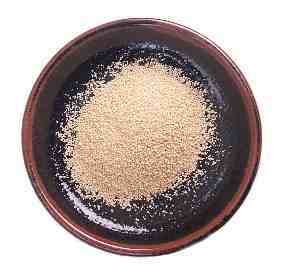 Beer yeast and wine yeast are used to convert sugar into alcohol and, in the case of beer and champagne, bubbles. 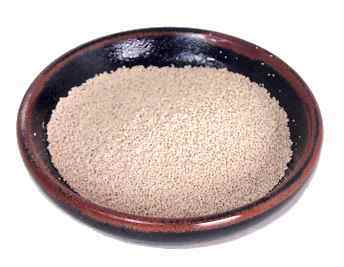 You should never eat raw active yeast, since it will continue to grow in your intestine and rob your body of valuable nutrients. 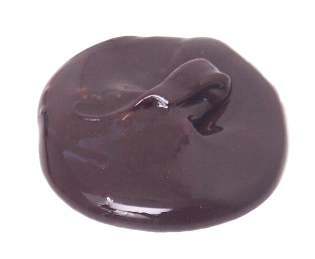 But once deactivated through pasteurization, yeast is a good source of nutrients. 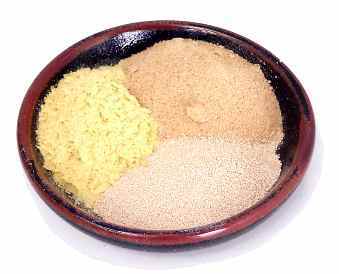 Brewer's yeast and nutritional yeast, for example, are sold as nutritional supplements, and Australians are fond of yeast extracts--like Vegemite, Marmite, and Promite--which they spread like peanut butter on bread. 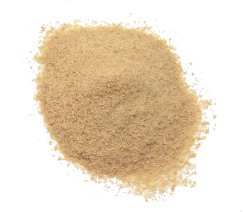 baker's yeast = baking yeast = bread yeast Equivalents: 1 tablespoon = 1 package = 1 cake Notes: This is used as a leaven in breads, coffeecakes, and pastries like croissants and brioche. It works by converting sugar into carbon dioxide, which causes the dough to rise so the bread will be light and airy. 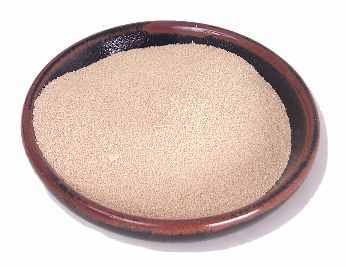 Yeast comes either as dry granules or moist cakes. 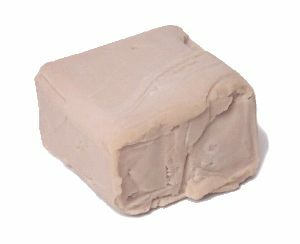 It becomes less potent after the expiration date stamped on the package, so dough made with it may take longer to rise, or not rise at all. If the potency of the yeast is in doubt, test or "proof" it by putting some of it in warm water (105° - 115° F) mixed with a bit of sugar. If it doesn't get foamy within ten minutes, you'll need to get fresher yeast. 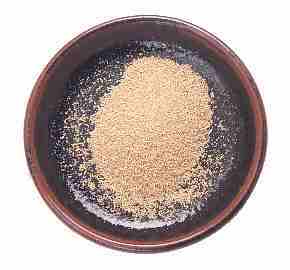 beer yeast = brewer's yeast Notes: This is used to produce alcohol and bubbles in beer. There are several varieties, each matched to specific varieties of beer. It's available either as a liquid or powder at beer-making supply stores. Don't confuse this with the brewer's yeast that's used as a nutritional supplement. That type of yeast is deactivated, so it won't produce any alcohol or bubbles. smoked yeast = bacon yeast = hickory-smoked yeast Notes: This is yeast that's been smoked, giving it a bacon-like flavor. It's used to flavor other dishes. Don't confuse it with active forms of yeast, like the kinds bakers, brewers, and winemakers use. If you eat them, active yeasts will continue to grow in your intestine, robbing your body of valuable nutrients. 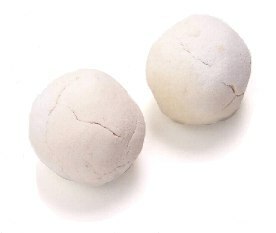 wine ball = wine cube Notes: These are balls of brewer's yeast that are sold in Asian markets. They're used to make wine. 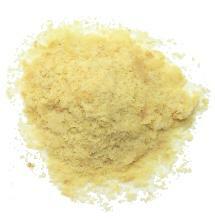 wine yeast Notes: This is used to convert the sugar in fruit juices into alcohol and carbon dioxide. There are different varieties, each best suited to producing a certain wine. 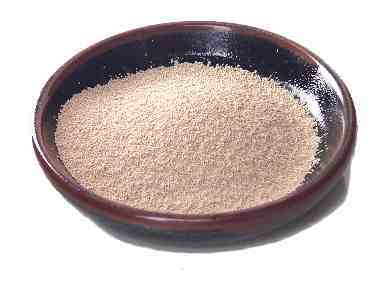 Champagne yeast, for example, produces more bubbles than other forms of wine yeast. yeast starter = sponge = levain Equivalents: 2 cups yeast starter = 1 package active dry yeast Notes: A starter is a mixture of flour, water, and other ingredients that's been colonized by wild airborne yeast and friendly bacteria. These one-celled immigrants lend the starter--and the breads made with it--a special character. Sourdough starter, for example, contains a strain of yeast that's tolerant of the lactic and acetic acids produced by the lactobacilli. Those acids give sourdough bread its characteristic tang. The French use a soupy starter called a poolish to make their breads, while the Italians use a thicker one called a biga. Up until the late 19th century, all yeast breads were leavened with starters, and keeping a starter alive in its crock was a routine household chore. To keep your own starter alive, wait until it's established, then store it in an airtight container in the refrigerator. To keep it healthy, bring it to room temperature once a week and remove all but about 25% of it (either make bread with it or discard it). Replace what you've taken with a mixture of equal parts warm water and flour, stir, then return it to the refrigerator. Properly maintained, a starter can last for decades, developing an ever more distinctive character as it ages. 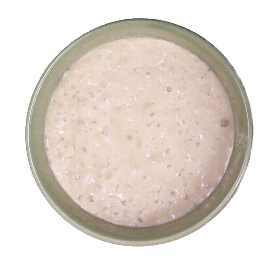 To use a starter to make bread, remove some of it (usually about 2 cups), and use it in place of other forms of yeast. Replace the amount you took with a mixture of equal parts flour and warm water. Discard your starter if it becomes orange or pink, or if it develops an unpleasant odor. It's easy to make starters from scratch, but even easier to borrow some from a friend. Since sourdough starters must be colonized by strains of yeast and lactobacilli that are particular to certain regions (like San Francisco), a homemade starter might not yield sour bread. Your best bet is to get a powdered sourdough starter mix from your supermarket or a mail order supplier. To make your own: Sprinkle 1 package of active dry yeast on 2 cups of warm water, wait 10 minutes, then stir in 2 cups of flour. Cover loosely, and let the mixture sit at about 85°.